By mapping your strategic initiatives out in this way your are able to evaluate your portfolio of initiatives according to three success criteria. 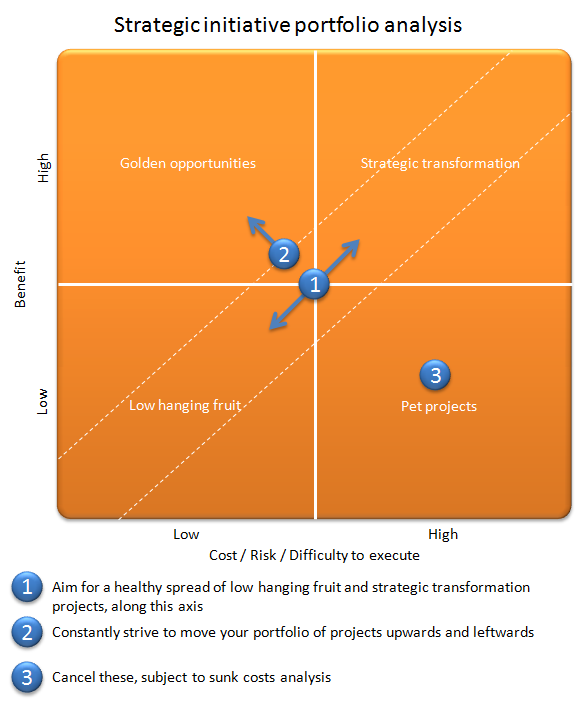 Firstly, have you got an even spread from low hanging fruit to strategic transformations? If you have only initiatives in the strategic transformation quadrant, you organisation is likely to stagnate during the short-term as the strategic transformation initiatives are likely to take a long time to bear fruit. Unless your organisation has very deep pockets, such a short term stagnation could place a strain on its cash flow and customers' loyalties. By including some "low hanging fruit" initiatives, you're likely to see earlier gains. This is also likely to boost staff morale and buy-in to the overall strategic change programme. On the other hand, if you have only initiatives in the low hanging fruit quadrant, your organisation may be lured into a false sense of security, only to be toppled as significant environmental changes occur or your competitors implement step changes in their own strategies. Secondly, are you continually challenging the innovators within your organisation to imagine the golden opportunities - those opportunities that produce disproportionately high benefits relative to their costs, risks and difficulty of implementation? By continually challenging your organisation to do so, your will hopefully move your portfolio upwards and leftwards on the grid over time. Thirdly, are you successfully avoiding projects with a low cost-benefit ratio? These tend to be the pet projects of key decision makers and/or resource allocators - although they are sub-optimal relative to the rest of the portfolio they are pursued on irrational grounds based on personal agendas. These should be eliminated. This may need to be done carefully so that the people with vested interests in these initiatives do not become alienated from the rest of the strategic change programme. However, it is important that this entire analysis is done on the basis of sunk costs - that is sunk costs should be ignored from the costs side of the analysis. A project that started out as a pet project but which has already spent 90% of its costs may now be low hanging fruit if you believe all of the benefit are still attainable for the cost of only 10% of the initial costs. Clearly you can't get the 90% of costs already spent back, but you should consider them a valuable lesson in the importance of avoiding these kind of projects in the future. As you get ready to kick of your strategic planning process for the year, this may be a great opportunity to evaluate your existing portfolio of strategic initiatives with a view to pruning it and developing it forwards. Please let me know how you get on in the comments below.